£10 per table/pitch prebooked, £15 on the day and pro rata for sellers. Doors open for sellers at 08:00. UPDATE 4 June: 20 sellers have booked. Some will be on the car park with multiple tables. There is still space inside and outside. £1 entry for buyers and £5 for early entries. Doors open at 09:00. Large village hall with space for 20 rectangular tables and more round ones. Plus space in the garden. Ample off road parking. We will be serving home made cake and refreshments. The Plough is next door for meals and ale etc. The picture above is of one the cycle auctions I have run at this venue in the last four years. I am planning another one for the autumn. Please message me directly or call 07813 211451 to book a table or ask questions. 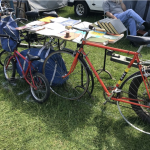 Please express your interest in coming to the event by visiting the Facebook Event for this cycle jumble and pressing the Interested or Going buttons. Itchen Abbas is midway between Kings Worthy (nr Winchester) and New Alresford. Or 10 mins from the bottom of the A34 and the M3, Its 5 mins off the A31. Buses go from Petersfield and Winchester and stop outside the hall. Google map link Nearest cash machines are in New Alresford at Lloyds Bank and the Coop. You can make a day of it and in the afternoon go on to the Alresford Music Festival or take a trip on the Watercress Line or just cycle around in the lovely countryside littered with pubs and cafes. During recent weeks I have been promoting the event with posters, leaflets and on-line. I have also visited similar events to chat up sellers and encourage them to come to this event. This has included the Ripley Cycle Jumble, Beaulieu Auto Jumble and South Hants Preservation Society Auto Jumble. You would be surprised how many bikes and parts are being sold at auto jumbles. The photo is of some of the bikes seen at the latter one which may make it to Itchen Abbas. You are booked. Please pay on the day. I’m intereted in selling is there still spaces available? Spaces are still available. Do you want to book a table? Upload image (Allowed file types: jpg, gif, png, maximum file size: 20MB. Note: This where I leave from to work at your location. Please contact me to find out when I can get to you.